For fast and easy sharpening of your chainsaw chain. The holder guides the file and the correct angle and depth. 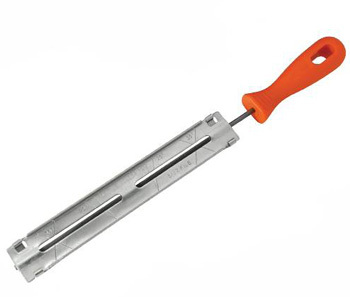 File fitted with hard wearing plastic handle. Please ensure that you purchase the correct size file and guide for your chainsaw. The operators manual will have details of the chain fitted to your machine. Delivery ot this item is FREE to UK postal addresses. Delivery one to three working days from order.